COSTA-GAVRAS (with Demetria Daniels) recently was interviewed by Paul Holdengraber of the NY Public Library. The interview was presented by the Onassis Cultural Center, and introduced by Director Ambassador Loucas Tsilas. The event was organized by Ms. Amalia Cosmetatou, cultural director. 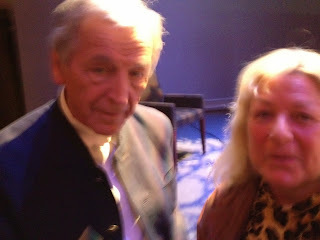 Mr. Gavras, director of "Z" was awarded an Oscar for Best Foreign Language Film in 1969. He has directed more than 22 films winning again another Oscar for "Missing" with JACK LEMON and SISSY SPACEK in 1982. He is best known for his overt political themes and his rare talent to merge controversial political issues with entertainment. Best in the summer- "Oresteia", the opera, by Sergey Taneyev, first time staged out of Russia at the Bard SummerScape at Annandale-on-the Hudson. Also the outdoor operas presented by the Metropolitan Opera House. Walls and Bridges by the VillaGillet.